The Town Park, adjacent to Town Hall located at the corner of West Cannon Street and Coastal Highway, houses playground equipment for young children, a gazebo and shuffleboard court. The Barefoot Gardeners Club has installed a stunning butterfly garden that is guaranteed to keep you entertained with its changing display. The park is funded in part by donations. If you wish to support these activities and improvements to the park, we would be glad to honor your donation with a Memorial Brick Paver to be placed in the walkway that winds through the park. 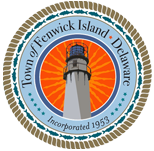 Additionally, you may elect to purchase a Fenwick Island License Plate at Town Hall. Villalon Hall located within Town Hall is available for rental to residents of Incorporated Fenwick Island. Limitations and Restrictions apply. If you believe that your organization qualifies for a rental, please contact Kristy Brittingham, Finance Administrator, for more information. 302-539-3011 ext 4. Cannon Street Park, located on W. Cannon Street adjacent to the Public Works Facility offers a Canoe/Kayak ADA Launch, a picnic area and a brick walkway to the canal. The park also offers half court basketball and benches to enjoy a beautiful rain garden and water wildlife. To preview the Little Assawoman Bay Water Trail map, click on the link Kayak/Canoe Launch Map. The Town of Fenwick Island is committed to developing quality educational and recreational programming opportunities, as well as providing town-wide special events. We have a long history of involving the private sector in supporting these event through public and private partnerships. For a list of dates and times, visit the calendar on the home screen of the website. Did you know? During the fall DNREC Coastal Cleanups of 2011 and 2012, Fenwick Island volunteers picked up 699 cigarette butts and 125 cigar tips. In 2013 the DNREC Coastal Cleanup collected 1675 butts from the cigarette receptacles at the beach entrances and in the parks. In 2014 the number collected was 1557. 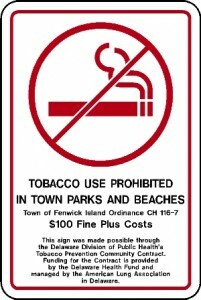 So in 2013 and 2014 more than 3,000 cigarette and cigar butts were kept off Fenwick Island Beach. It takes an average of 25 years for a cigarette to decompose. More information is available at the American Lung Association. The Delaware Health Fund and the American Lung Association in Delaware have helped to make this information program possible.